Christmas is all about spending several days sharing enclosed spaces with loved ones, and once the catching up and hugs and "look how much you've grown" comments wear off, you have to get creative about how you're going to make the most of the rest of your time. For the most genius and savage among us, this means meticulously developing pranks that'll get the whole family laughing (or crying) for the 365 days to come. 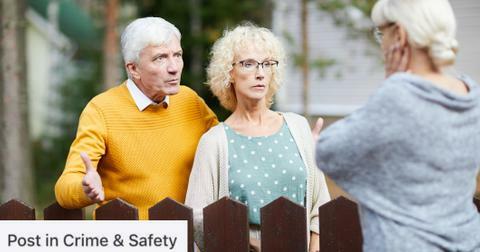 Judy Brown gave the prank she pulled on her father more than a little thought this year. And it was well worth all the planning, because she won the internet over on Christmas. Her anecdote begins with recounting the prank she played on her father two years ago. This is something of a walk down memory lane, setting up the stage for the wonders that were about to come. "Some of you out there may recall that in 2016 I played an excellent Christmas prank on my long-suffering Dad. It worked a treat," she shared on Twitter before taking us through some of the most memorable moments of that Christmas. Like any person with a sense of humor and a traumatic family history, Judy's favorite hobby is to get her parents wound up. 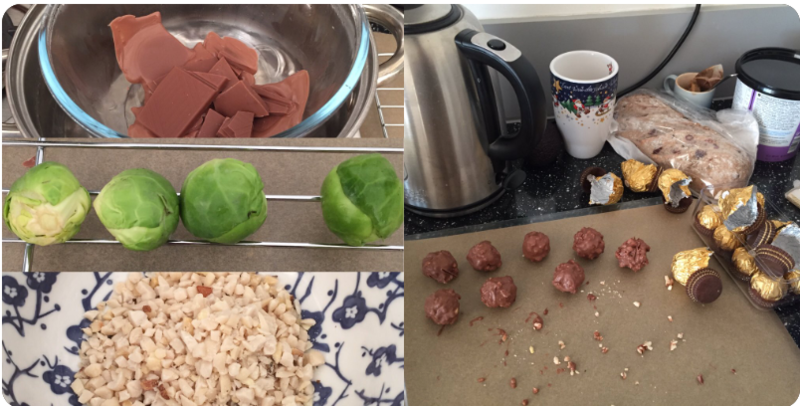 When she discovered that Brussels sprouts were the perfect foil to Ferrero Rochers, she called her discovery "ingenious" and couldn't wait to get to work. 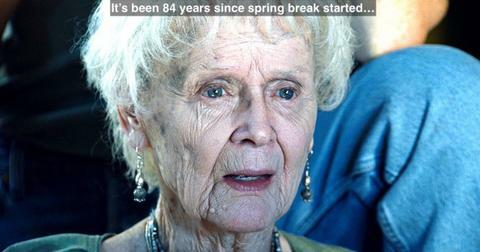 But this year, she wanted to go bigger, better and more committed. So much so that she strategically sat last year's pranks out, in order to fool her father into thinking that she had, perhaps, matured past the age of childish tricks. 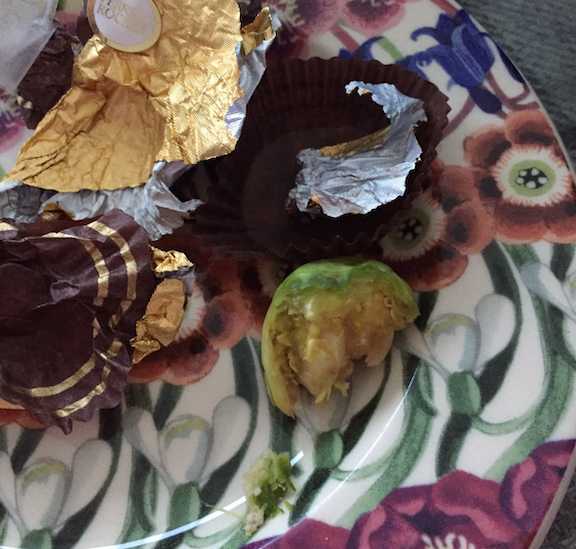 She writes: "Last year I decided to play the long game & didn’t tamper with the confectionary: spooked by the year before, he would not touch a single Ferrero Rocher (which was great because he usually inhales them at 750mph) so there were Ferreros aplenty for the rest of us. I bided my time." "And so, yesterday," she continues, "home for Christmas and with the devil at my elbow, I embarked on my most audacious sprout prank yet." 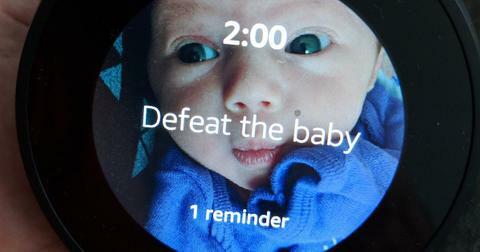 Look out, world! 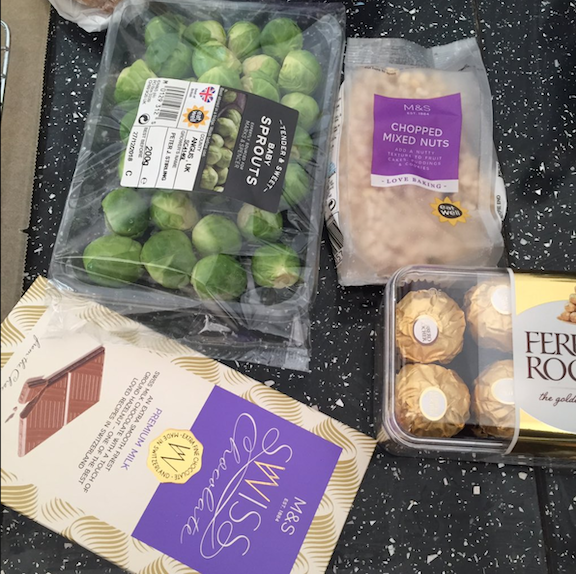 Judy shared her loot from the grocery store, which, from the looks of the chopped mix nuts and the milk chocolate bars, leaves her way better prepared than she was when she was a beginner at this prank stuff, back in 2016. Take notes, family pranksters. This is how it's done. Judy writes, "While he was out I dipped the sprouts in chocolate, rolled them in chopped hazelnuts, and did all I could to replicate the iconic Ferrerro." Chances are this is what all the extra accoutrements were for. Then, Judy "re-wrapped and (this is crucial) re-sealed the box with its original tape and a tiny dab of glue." 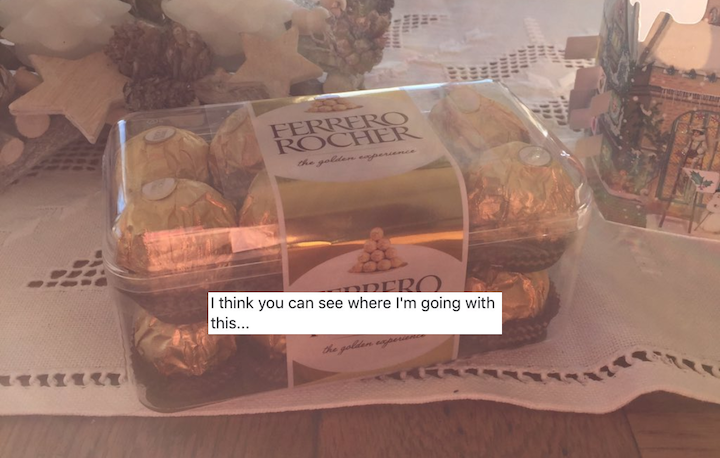 Because anyone who's ever tried putting things back in Ferrero Rocher foils (or Baci, for that matter) know it's no walk in the park to make them look like they're totally untouched. Not like I speak from experience, or anything. 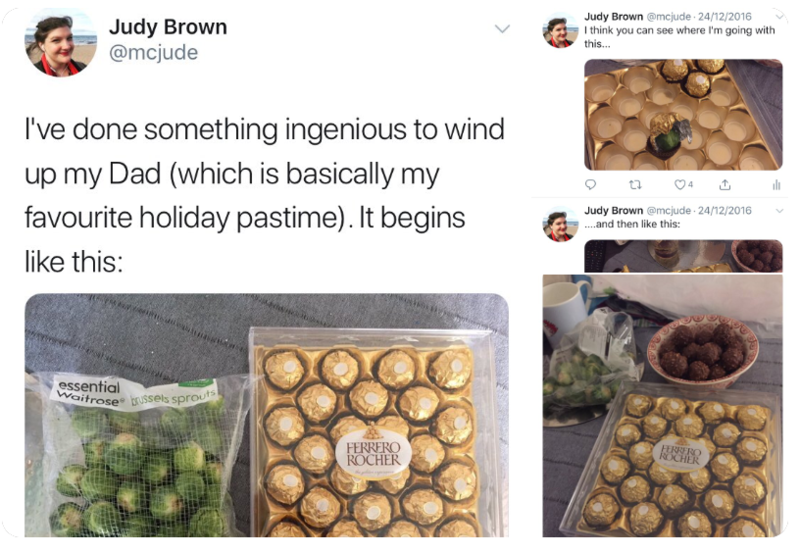 Then, Judy completed her prank with the perfect move, which was dropping her pack of faux-Ferreros "amongst" (double props for the use of amongst) "a bag of tasty gifts from my Aunt." Then, she took the backseat and watched the fruits of her labor. As you might imagine, our trusted narrator Judy wasn't about to rush her Christmas prank. She wasn't about to give herself up by offering her dad a Ferrero, or act all desperate in front of him. No, she handled the situation the way all of the most savage pranksters do: with total aplomb. "Last night he viewed them with suspicion when they came out the bag," she wrote on Christmas Eve. If my kid had ever changed my delicious hazelnut-milk chocolate for a RAW brussel sprout, they'd have another thing coming. In fact, just the thought is making me nauseous. But, the dad thought, Judy had been "out all day," how could she POSSIBLY "have tampered with them?" Dad was not in the mood to take any chances that evening, and the candies "sat in the kitchen all night." The next morning, on Christmas day, when the magical spirit of Santa was giving dad something of a sweet tooth, he "eyed the box" once again. "He quite likes a post-brekkie Ferrero. He approached. I hovered in the kitchen, careful not to spook him," Judy writes. "And Lo! He opened. He EXAMINED. He unwrapped. He examined FURTHER. Fears allayed, he popped the whole thing in his mouth. His face played a symphony of emotions: satisfaction, triumph, smugness, consternation, confusion, realization, horror, disgust." Just look at this absolute horror. I don't even know where to begin. My stomach is making all kinds of noises just looking at the picture above. Judy, on the other hand, is practically glowing at her success. After the disaster finally went down, she took to Twitter to update her thread. "I am still chuckling. I will all day long," she reported. "I know his retribution will be swift and terrible, but no Christmas gift could be greater than this: seeing my Dad, despite his efforts to avoid it, unwittingly eat a raw sprout. Merry Christmas, one and all." Honestly, I've got to give it to her for the impeccable planning, staging, waiting, and flawless executing. It's the kind of prank that should go down in Christmas history. But Judy wasn't the only person who had put some thought into how she was going to get her family good this year. 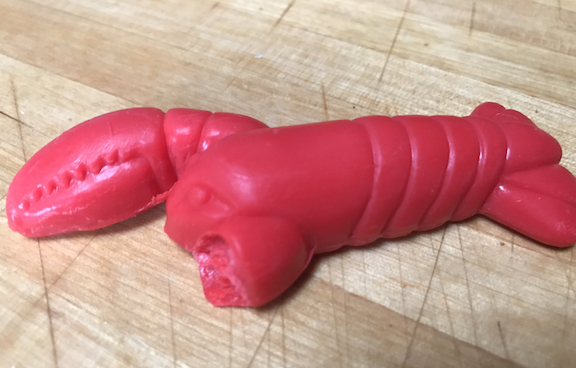 Take Jenn, whose favorite part of Christmas is the handmade chocolate lobsters her aunt sends her every year. Only, her favorite presents weren't exactly what she was expecting this year. "This year they are soap," she wrote. "Guess how I found out?" Well played, aunt in Maine, whoever you are. 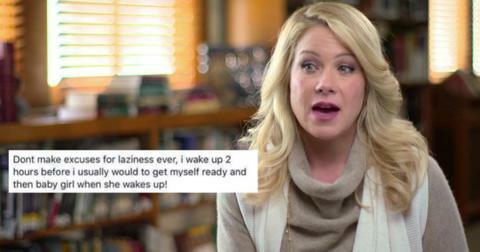 People on Twitter loved this prank and added their hilarious two cents. "Can't wait for next year when you shower yourself with chocolate," wrote one person on the platform. Another added, "There's no way your aunt wasn't building up to this long con over time to specifically do this to you. This is a masterstroke." Because one does not simply pull off that kind of genius prank without thinking it through completely and totally, calculating your opponents' love, say, for chocolate and disdain, say, for Brussels sprouts. 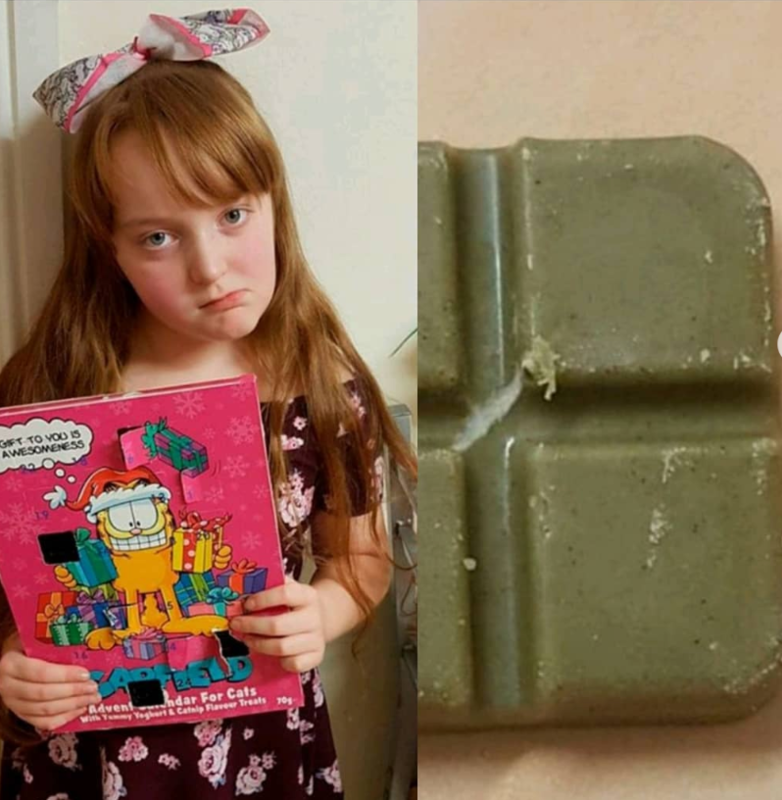 A third mother went absolutely viral, not exactly for pranking her child, per se, but for being so neglectful she didn't realize she'd bought her daughter an Advent calendar for cats, filled with catnip instead of chocolate. She wrote "Omg I’m the worst mother everrr…" on Facebook. "I bought Alexis and Aurora Advent calendars but Alissa wanted a different one so while in B&M I quickly grabbed a Garfield one without reading it as it was placed with the other calendar. Alissa was complaining her chocolate was green so I thought maybe it’s a weird apple flavor one. But no, tonight she showed me the chocolate and it smelt weird so looked on the back and it says yoghurt and CATNIP flavor hahah!!" Needless to say, Alissa was not a happy camper. And somehow, it took the family 11 days to notice their mistake. Thankfully she got a new Advent calendar and was able to make up for the week's worth of catnip in her system. These Christmas pranks are definitely ones to take note of for next year. But they also beg the question: who hurt these people? !